You know I’m adventurous. Every time I go to Tan Kah, I walk past this nondescript shop, Dong Bei Yi Ji Jia (North-East One Family). The exterior is very scary, like those shop that will kill you and use your meat for their food. The doors are glass-panelled but photos of food are all over the door so you cannot see inside. But I ah Beng what. Scare what. So I walked boldly into the shop and the spice of Szechuan pepper hit me like a wave. Wonderful. We were there at five-plus and the entire restaurant was packed with China people! It’s China-owned, China-run. Can you believe it? It looked so quiet outside, and it wasn’t even dinner time yet. It must be good! I got excited. The Pork with soy sauce paste (京酱肉丝) ($8) is a specialty of Northeastern China and my friend said it tasted exactly like the one he had in Shanghai. 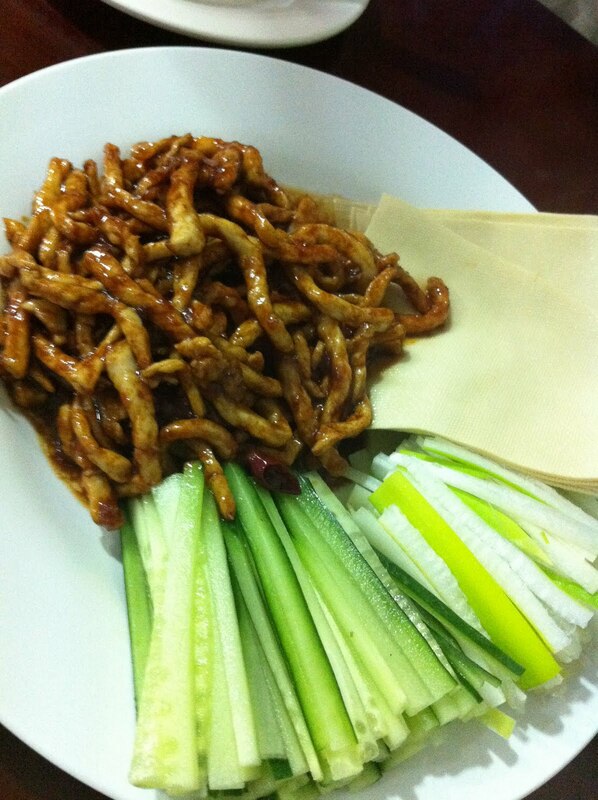 It’s a little like popiah: you use the beancurd skin and wrap the meat, onion and cucumber, and eat it. Being used to popiah, I thought the beancurd skin was a bit tough, but after a while–I got teeth ok–I thought the dish was very marvelous. The crispy and fresh cucumber; the strong, suffocating onion; the soft stringy salty pork (what is it in strings? ); and the milky taste of the beancurd skin mixed well together. Also: I don’t know if the home-made chili on the table is for the wrap lah..but I added it. One is the hainanese chicken chili and the other like a sweet sambal chili. Try both. I love it. The hainan chili added a sourish taste to it and the sambal a sweetness, so each changes the taste completely. Cumin Mutton (牧然羊肉) ($14). This is very similar to Mexican, Spanish dishes, sourish and spicy. It is stirred fried with onions, soy sauce and green chili (or jalapenos). I think it was very appetizing: salty, spicy, and sour. The portion was generous but the mutton was of an interior quality. 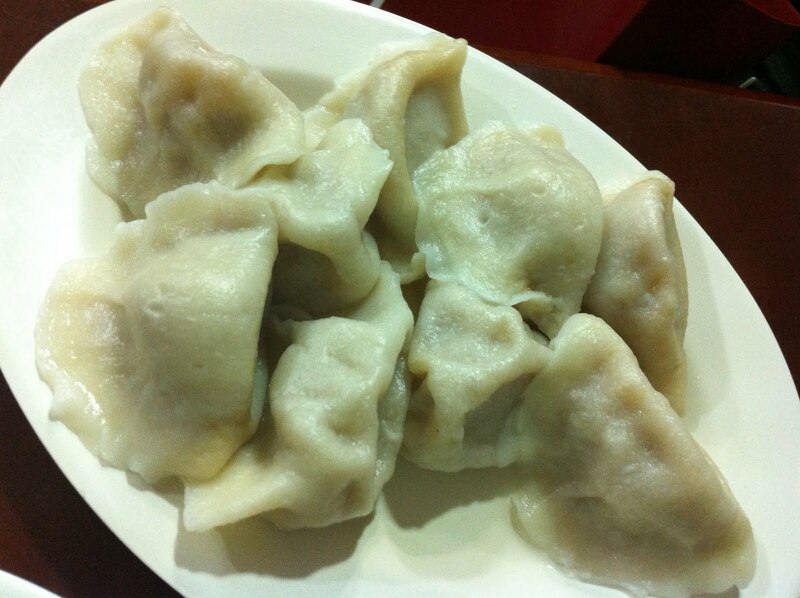 There are four different kinds of dumplings and we picked the Pickled Cabbage and Pork Dumpling (酸菜水饺) $5. Nothing really special about this, but you can tell it is made from scratch, not those you buy at supermarket. The skin was thin, and was satisfying. Again, the meat was a bit powdery (not fresh? ), but no complaints here. Tip: The famous dishes are the enlarged photos on the menu. The restaurant gives you an order list and you tick what you want. No water, buy a drink. So there is a minimum of contact with the service staff but sometimes it took a while to get the attention of a waiter. Overall, this is no fuss, authentic China food. I left the restaurant feeling very full and satisfied. And guess what NO CARBS! (ok, hardly any carbs.) We spent $32 for 2 persons. Quite worth the money.